Thomas, Robert H. Distributed Computation Research at BBN Dec 1974. Creeper was an experimental mobile program written in 1971 by Bob Thomas at Bolt, Beranek and Newman Inc. The program was written in PDP-10 assembly and moved between TENEX systems over the ARPANET. 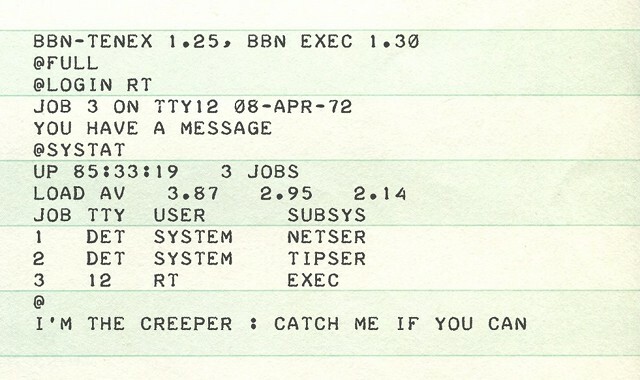 As it moved Creeper printed a message similar to “I'M THE CREEPER : CATCH ME IF YOU CAN” on the Model 33 ASR teletype. The techniques developed in Creeper were later used in the McROSS air traffic simulator to allow parts of the simulation to move across the network. Shortly after Bob demonstrated Creeper, Ray Tomlinson wrote an enhanced version which replicated instead of simply moving. Ray then wrote a program called Reaper which moved through the ARPANET removing copies of Creeper. The story of Creeper & Reaper inspired A K Dewdney to set up the initial version of Core War, describing Creeper & Reaper as “two programs doing battle in the dark and noiseless corridors of core”. Kirk, Kelley E, ed. Transcription of All ARC Meeting 3 November 1972. California: Stanford Research Institute, Dec 1972. Thomas, Robert H. Distributed Computation Research at BBN. Massachusetts: Bolt, Beranek and Newman Inc, Dec 1974. Deppe, Mark E. and James P. Fry. "Distributed data bases: A summary of research." Computer Networks 1 (1976): 130–138. Shoch, John F. and John A. Hupp. Notes on the "Worm" programs -- some early experience with a distributed computation. California: Xerox Corporation, May 1980. Markoff, John. "More Worms in Xerox's Garden." InfoWorld (14 Sep 1981): 6–7. Dewdney, A. K. "Computer Recreations: In a game called core war hostile programs engage in a battle of bits." Scientific American (May 1984): 14–22. Dvorak, John C. "Killer DOS Stalks Software." InfoWorld (7 May 1984): 152.